Solving a problem through design research, brainstorming, and, ultimately, coming up with a big idea that incorporates design, manufacturing considerations, and marketing plans (and, later, getting to manufacture and sell one selected design) is unheard of for the majority of 8th grade students. Add the fact that they pitch their ideas and plans to real entrepreneurs, educators, and business owners and it’s something very few students have the opportunity to do in K-12 schools today. Dig-8 (which stands for Discover, Innovate, and Grow and the “8” represents the 8th grade class) was created by a Chicago-based product development firm, Beyond Design, Inc., who brought their passion for design and education to Chicago Public Schools (CPS). Starting with a K-8 school in Chicago, Beyond Design joined forces with Nettelhorst School and the Science and Entrepreneurship Exchange (SEE), which is in its second pilot year, to teach students about product development and give them the opportunity to design real products, and create real startups, right in the classroom. The program helps students develop principles and skills they will use for the rest of their lives, in any profession they choose. 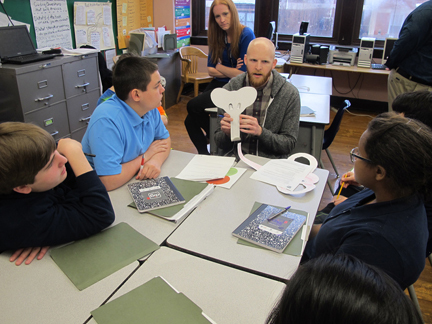 Throughout the program, students worked with product design professionals from Beyond Design, Inc. and student mentors from Northwestern University who coached them through each step and encouraged them to be creative thinkers and problem solvers. Split into eight teams, students worked with their mentors to conceive and visualize their ideas and create viable solutions to the problem: What do I do with my stuff when I walk into my house? Each team created a home, work, or school organization product designed for their persona (which they discovered through their research and selected as a team). Students conducted research, identified user needs, brainstormed ideas, and created mock-ups using foam core and paper. The product ideas ranged from fun and whimsical ideas to contemporary designs intended for people with small living spaces. As their final presentation, students pitched their ideas to a panel of entrepreneurs, business professionals, and educators who selected only one design to move forward. As one large team, the class focused on building their startup around the chosen product, the Elephant Hooks. 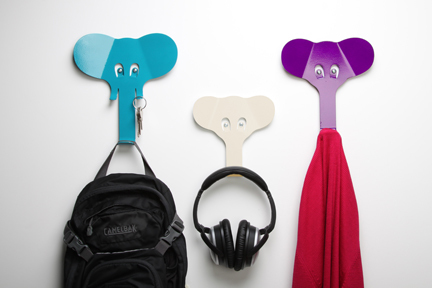 To gain support for bringing the Elephant Hooks to market, Beyond Design worked with the students to develop a Kickstarter campaign, where the consumer market would give them their final grade. Last month’s launch of the Kickstarter campaign marked a dramatic moment for the students, and the culmination of an exciting process of invention, design and persuasion. The goal for the 30-day campaign was $6,000 and, in the end, $10,864 was raised. The excess funds will be used to support future dig programs and help develop an inaugural maker space at Nettelhorst that will serve as an incubator for students to invent, design, and prototype their ideas. The hope is that we can scale the program out to more schools in the coming years and allow more students to experience what it’s like to create and manufacture a product of their own. Dig-8 teaches students important problem solving, presentation, and cognitive skills, as well as research methods, sales strategies, critical analysis, and manufacturing techniques. In addition, it encourages creative thinking, collaboration, team building, and leadership. The goal of dig-8/SEE is to increase Chicago-area (and, secondarily, national desire) among private companies, parents and educators to actively improve product development and manufacturing education in the elementary/middle school space. The program hopes to inspire and educate Chicago students to become tomorrow’s entrepreneurs, innovators and engineers, through inspirational and practical hands-on business and product development experiences. Dig-8 is designed to be scaled both up and down to different student age levels, by changing the project parameters including materials, fabrication processes, cost, and target market. This program has been a tremendous success and taught students a valuable process on how to seek out areas that need innovation and strategically bring their ideas to market. The program does exactly what Beyond Design and SEE set out to do – educate students about product development and entrepreneurship and allow them to discover, innovate, and grow. About the author: Jessie Mumgaard is a marketing communications manager at Beyond Design, Inc.